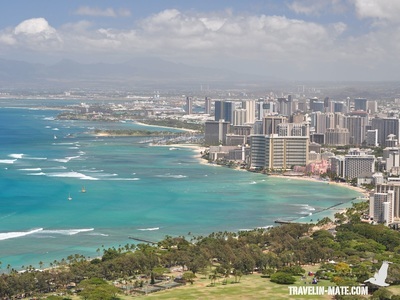 Coming from Waikiki: follow Kalakaua Ave south towards Diamond Head that turns into Monsarrat Ave at Honolulu Zoo. Continue on Monsarrat Ave until it changes into Diamond Head Road. Behind Kapiolani Community College to your left make a right into the little road leading you to the Diamond Head’s crater and parking lot. Coming from the North Shore: take HWY 83 (Kamehameha HWY) east to Kailua and change there onto Likelike HWY towards Honolulu. Change again in Hololulu onto H1 east towards Waikiki and exit at 6th Ave (exit 25B) and make a right. 6th Ave becomes Alohea Ave that you have to follow before turning right into Makapuu Ave. From Makapuu Ave turn left into Diamond Head Road and make a right into the little road leading you to the Diamond Head’s crater and parking lot after passing Kapiolani Community College to your left. Coming from Kailua: Use Pali HWY to Honolulu and change in Hololulu onto H1 east towards Waikiki. Exit at 6th Ave (exit 25B) and make a right. 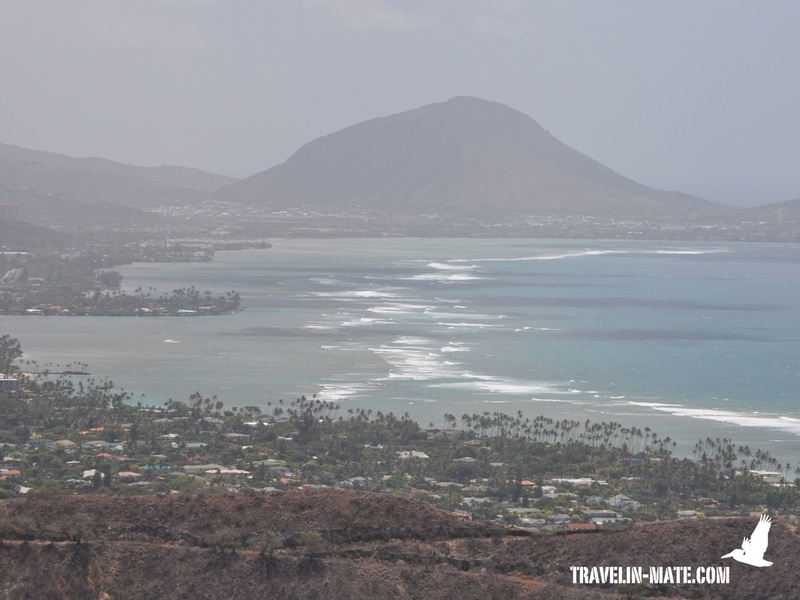 6th Ave becomes Alohea Ave that you have to follow before turning right into Makapuu Ave. From Makapuu Ave turn left into Diamond Head Road and make a right into the little road leading you to the Diamond Head’s crater and parking lot after passing Kapiolani Community College to your left. 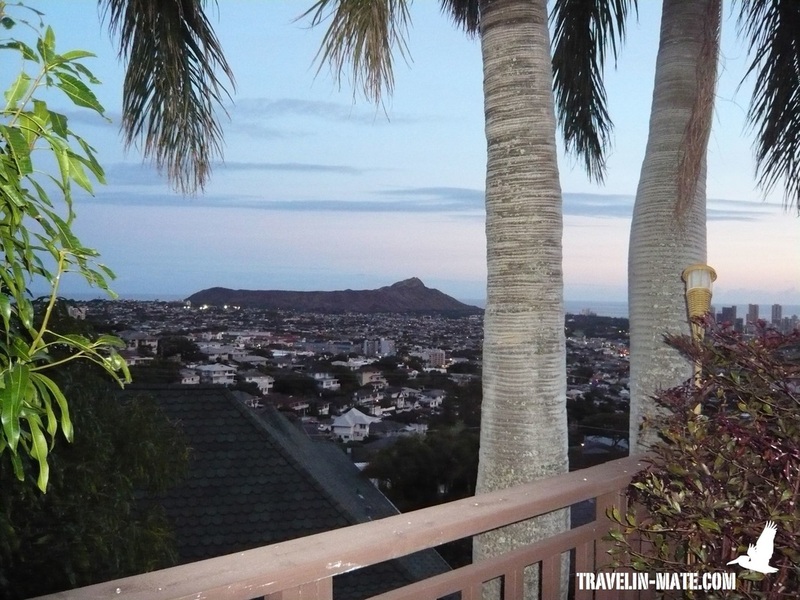 Staying at the South Shore you can see the volcanic tuff cone soaring above the adjacent neighborhoods afar. It doesn’t only look impressing from the outside, climbing the steep slopes and stairs to the top and crater rim opens an incredible view over Honolulu and the shoreline. If the sky is clear you even can look into the central valley and along the mountain ranges. 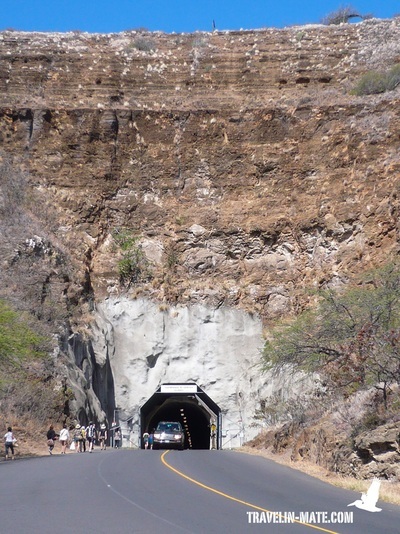 Diamond Head is so close to Waikiki that you can walk here unless you want to combine the tuff cone with a tour along the eastern shore. The cone originated from a series of volcanic eruptions on Oahu caused by Ko’olau Volcano and is estimated to be about 150,000 years old. The hike is only 1.5 miles long (~ 2,2 km), which isn’t much, but you shouldn’t underestimate the elevation gain. First you are climbing up an unpaved and winding trail before you have to ascend 74 steps. Those are leading you through a tunnel followed by another 99 steps going to another tunnel. From there you approach a narrow staircase with 30 more steps until you finally end at a covered area. The view in this area is restricted but through a small skylight you enter the outside of the coastal artillery platform. Finally you reach the unrestricted 360-degree vantage point at the rim. Bring enough water for the short hike since it can be getting very hot and humid over the day. A person of trust should accompany people afraid of heights since there might be scary parts in particular during your descend on the steep stairs. The Kuapa Pond is a scenic outlook over the most eastern residential area of Honolulu named Hawaii Kai. The area was gained from Kuapa Pond in the late 50’s and early 60’s. From Diamond Head turn right into Diamond Head Road and make a sharp left into Kahala Ave that brings you along Diamond Head Beach and a wealthy neighborhood. From Kahala Ave make a left at the end into Kealaolu Ave until you hit H1 and Kalanianaole HWY. 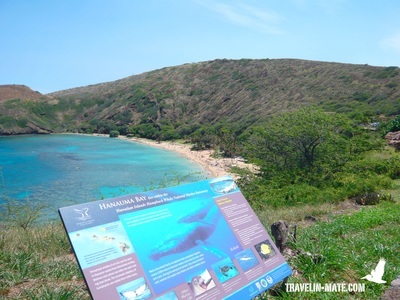 Follow Kalanianaole HWY (Route 72) for about 5 miles towards Haunama Bay. 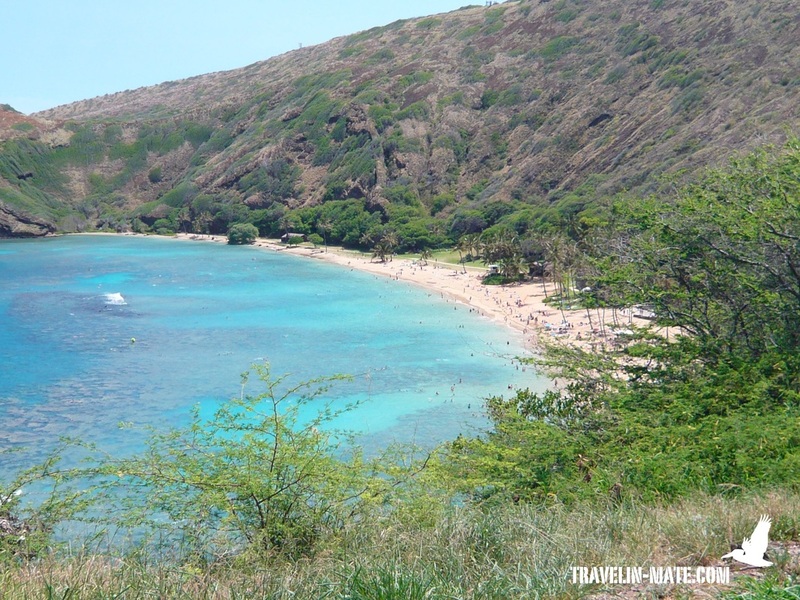 Just one more mile further east follows Hanauma Bay, one of the most popular and famous snorkeling spots on Oahu. 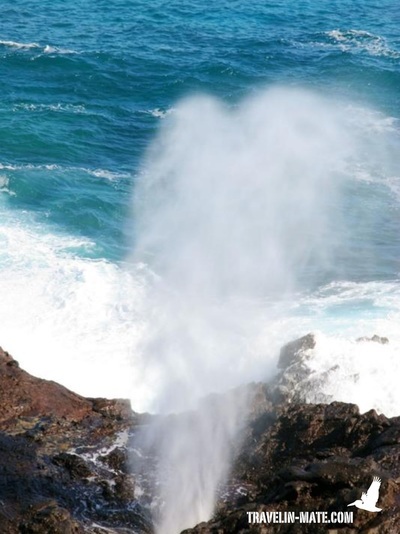 It is located within a volcanic cone and was named after its shape Hana (bay) and uma (curve). Before you are allowed to explore the bay and its colorful sea life including green sea turtles you have to attend a short film presentation. The movie has the intention to sensitize the visitors about the bay’s fragility and to give tourists an understanding how to behave during their stay. 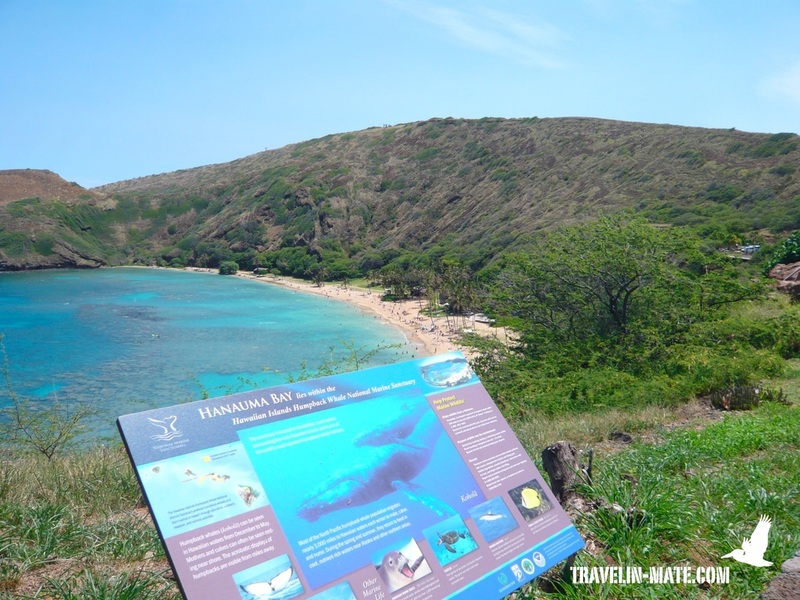 Many of you might start laughing now but as soon you are spending a day in Hanauma you get an idea how many idiots are still running around hunting, touching and bothering the fish and turtles, next to stepping on coral all the time. 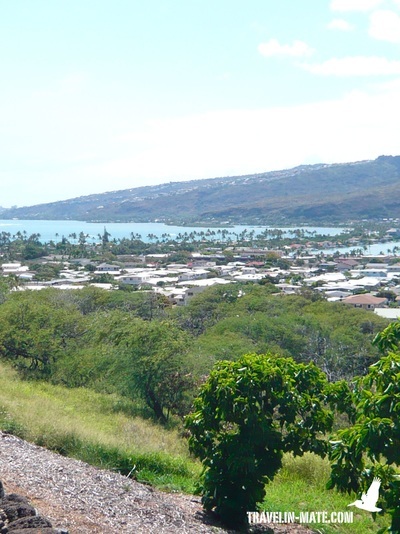 In the past the bay was a popular picnic ground and fishing spot for locals before the road from Honolulu was paved and the tourism increased slightly. During World War II the bay was closed to the public but reopened afterwards with improved amenities like an enlarged area that was gained by blasting old undersea cables and parts of the reef away. Although the bay was named a protected area and volunteers informed visitors about its fragility, it was overrun by guests from the 1970’s to the 1990’s. The result was an overusage of the beach and bay with an extensive damage to the reef. One counteraction to decrease the annual visitor numbers was an entrance fee that was established in 1998. Later, in 2002 an Education Center was errected that requires visitors to watch the short film presentation before they are able to enter the area. Since then the amount of annual visitors went down to one million per year. Snorkeling here without fins definitely requires reef shoes since the coral is really sharp and you can cut your skin deeply. If you do not possess snorkeling gear you can rent it at a booth on the beach. 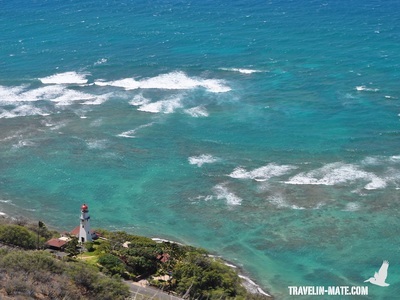 Leaving beautiful Haunauma Bay continue your trip along HWY 72 towards Kailua. On your way you will pass beautiful cliffs, which were formed during the Oahu volcano series when Koko Crater and Diamond Head exploded. From Lanai Lookout you have a nice view over the shore as well as from the next parking lot further north. 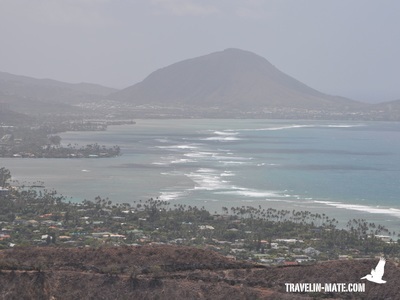 Another stop is called Koko Head Park from where you can take a trail that goes along the shore towards the north. 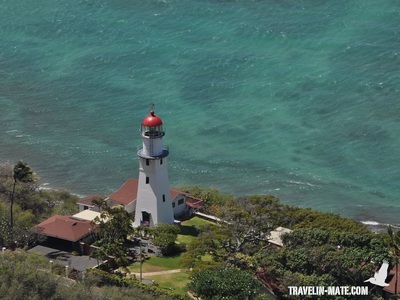 Afterwards, you will see Makapu’U Lighthouse and Makapu’U Beach followed by the small coastal town of Waimanalo and its beautiful mileslong beach. 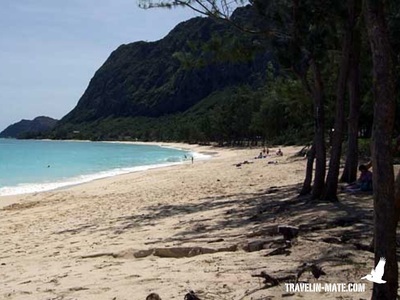 Although Waimanalo Beach features a magnificient 5.5 miles (~ 9km) long sandy stretch lined with ironwood trees it is surprisingly secluded. The missing palm trees, expected for Hawai’i, might be the reason. The shore is perfect for surfing beginners, and boogie boarders. 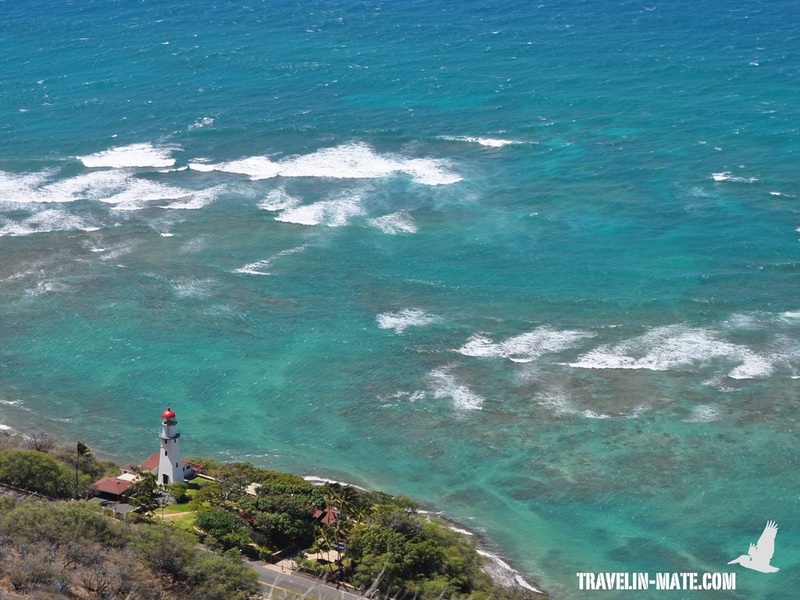 The ocean is a bit rougher than in Kailua but in general there are no dangerous hazards around. Sometimes it happens that the Portuguese Man-of-war, a very small blue jellyfish whose sting can bother you at least two days, comes ashore. But this only happens occasionally and it’s recommended to check the water before entering. BTW – occasionally, these tiny jellyfish can be seen almost on every beach in Hawai’i. Another beautiful beach just 8 miles (~ 13km) to the north is Lanikai Beach. 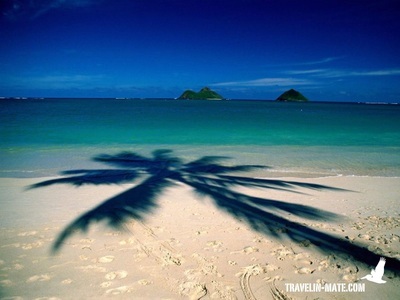 Clear and calm turquoise water adjoined by a white fine sandy beach lined with palm trees is pulling the visitors. Coming here during the week you might be lucky having sections almost for yourself. However, this changes with the weekend. No surprise since this beach is constantly ranked amongst the best beaches in the world! If you are looking for a parking lot in front you will be disappointed. 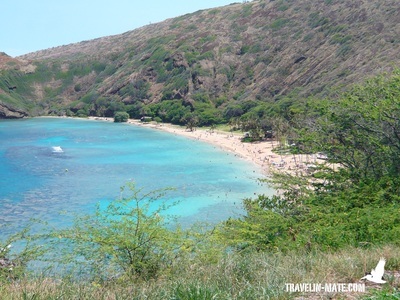 This beach is only accessible by using public beach paths going off the wealthy residential area around Mokulua Drive. I highly recommend this beach to spend the evening at since the scenery is breathtaking. For dinner I even would consider stocking up in Waimanalo or Kailua and having a picnic here.